Last night, before we sailed away from Parga, a duo of Greek musicians came onboard to entertain during the cocktail hour. This triggered memories—and discussions—of the movie, Zorba the Greek, and of the legendary Melina Mercouri. 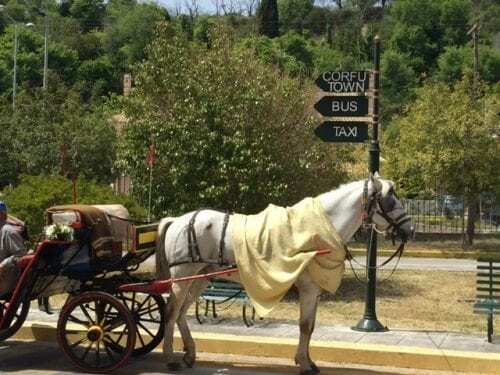 There are a number of ways to explore Corfu Town, including the horse-drawn carriage. Fortunately the tour I’ve chosen will not take me into any crowds. 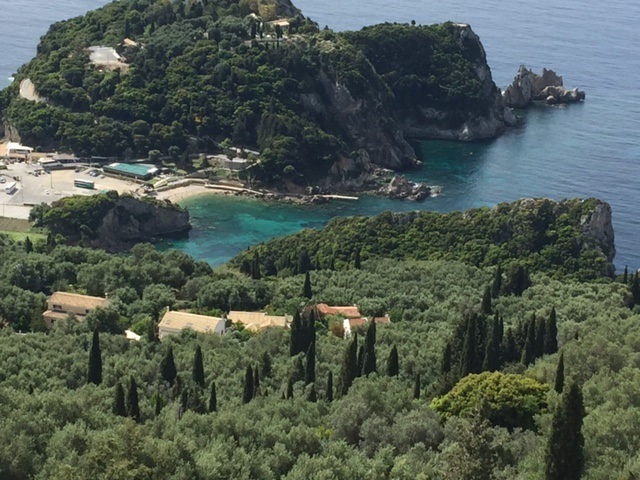 It’s called “Views of Corfu,” and it starts with a 30-minute drive up to Paleokastritsa, for a visit to one of the island’s most famous sites, the Monastery of the Virgin Mary. The current complex dates back to the 18th century, though it is believed that there had been a much older edifice. Here, only seven monks live, in quiet contemplation and learning. Though the site, especially the lush garden (where geraniums grow almost to tree height) is especially tranquil, our guide lets us know that by August, at the height of the tourist season, the place will be overrun with visitors. 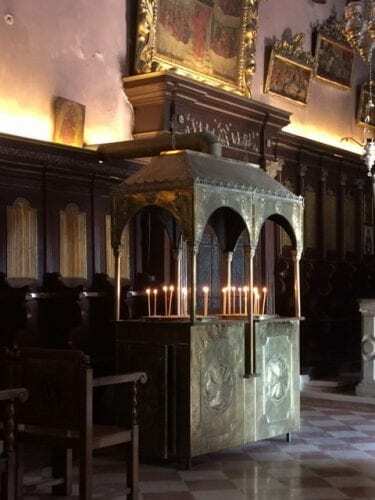 When we enter the church, our group is invited to make small contributions and to light candles, either in memory of loved ones who have passed on, or in hopes of having a prayer answered. I do, for the serenity of the small church seems to invite a thoughtful moment or two. Later, our coach takes us to Lakones, located at the foot of Mount Pantokrator, where the views of the sea and villages below are simply dazzling. 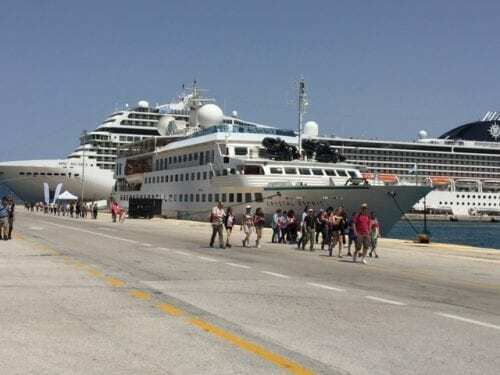 During our driving time, our guide tells us tales of Ulysses after the Trojan war, his travails as he tries to return home and his hostile encounters with a Cyclops and the monster’s father, Poseidon, god of the sea. 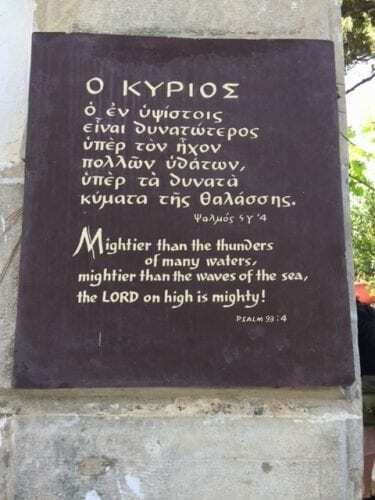 One part of the story ends with Poseidon turning the boat used by Ulysses’s sailors into stone. At the appropriate moment, our guide points out a rock, which, if you use your imagination, somewhat resembles a boat—and that, she says, is supposed to be the petrified vessel. I dutifully photograph the rock, for Greece is the land of colorful legends, and I like, at least for the moment, to believe them all.